Mike Leach usually has adhered strictly to an eight-player, two-player-per-position rotation. 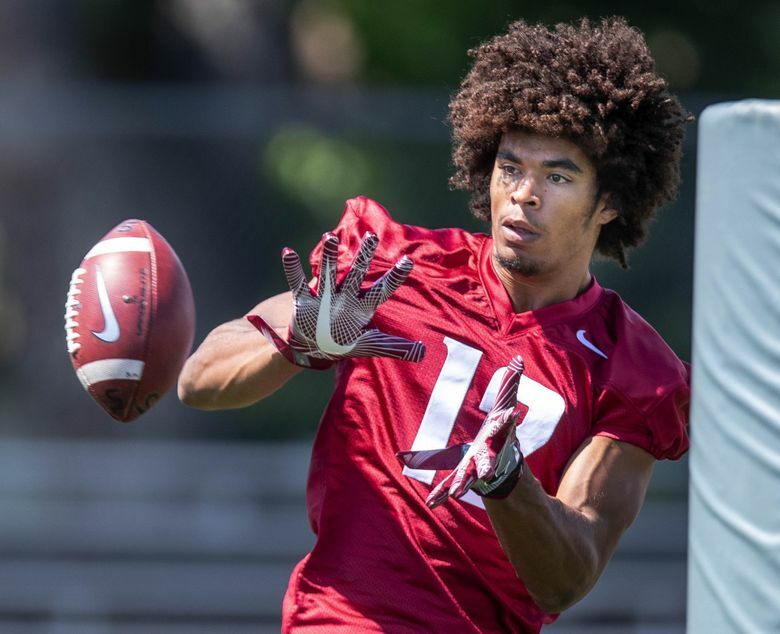 But the Cougars happen to be so deep at wide receiver this season that he says three additional players are likely to get playing time this season. PULLMAN – In order to breed competition at every spot on the field and ensure no player becomes too complacent, Mike Leach and his assistants typically don’t make too many depth-chart promises or offer up many teasers in the weeks leading up to a new season. WSU opens Sept. 1 at Wyoming. Since his days at Texas Tech, Leach has adhered strictly to an eight-player, two-player-per-position rotation, reasoning that it best allows a team to allocate sufficient reps to the team’s best pass catchers, giving them enough opportunity to improve. But the Cougars happen to be so deep at wide receiver this season that the coach says three additional players will get playing time this season. As for the top eight? At the outside “Z” receiver position, Leach will call on junior Dezmon Patmon and redshirt junior Easop Winston Jr. The sure-handed Winston redshirted last season after transferring from City College of San Francisco and Patmon, an imposing goal-line target at 6-foot-4, 220 pounds, caught 35 passes for 379 yards in 2017 with three games of 60-plus receiving yards. The other outside position, “X,” will be manned by sophomore Tay Martin and true freshman Rodrick Fisher. Martin was the Cougars’ breakout player on offense near the end of his rookie season, catching six touchdown passes in the last six games. Fisher is an early enrollee who stood out on both the track and the football field during his time at Spokane’s East Valley High School. Redshirt sophomore Renard Bell and redshirt freshman Travell Harris, meanwhile, made the cut at the inside “H” receiver. Bell emerged as a reliable deep-threat for the Cougars last season with three plays of 50 yards or more the first half of the season and Harris is a zippy slot receiver from Florida who will contribute heavily on special teams. At “Y” receiver it’ll be senior Kyle Sweet and sophomore Jamire Calvin, a duo that combined for 91 receptions, 833 yards and five touchdowns in 2017. Sweet is a crisp route-runner who has appeared in 37 games for the Cougars and Calvin is a small, but dynamic speedster who made a quick impact last season as a true freshman.